I love Amazon.com. Love. They have great prices and selection and wonderful customer service that has yet to let me down and I’ve been a customer for almost 10 years. I regularly recommend people buy products there. In some cases, they are the first and only place I go to buy something. That’s the built up capital that they have with me. I have spent a countless amount of money buying things from them. I use the Subscribe & Save feature to get particular items delivered regularly. I am an Amazon Prime subscriber and have been for years. I have an Amazon.com Visa card. I like them on Facebook and follow them on Twitter. I am a long term Amazon.com shareholder. Unfortunately, though, I believe that Amazon has a real problem on their hands with the Customer Reviews feature and, eventually, they are going to have to face it. Specifically, the Amazon.com Community Team is going to have to face it. 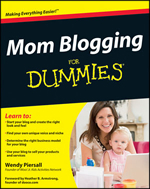 Wendy Piersall, an acquaintance of mine, recently authored the book “Mom Blogging for Dummies.” I am mentioned in the book, though I didn’t realize it until I already had a copy in my hands. Wendy was, understandably, happy to launch her book officially last month. I know the feeling. What I was not totally aware of was the distaste that some people have for the very idea of a mom that is blogging. To the point where they make fun of, question the intentions of and try to admonish those who do and make them feel as though they are doing something wrong. Sadly, this reared it’s ugly head in the Amazon.com customer reviews of Wendy’s book. How did it get started? Well, a web celebrity of sorts apparently falls into this camp of people. Somehow, Wendy’s book came to his attention. Suffice to say, he doesn’t want a book to exist on this topic. Referencing the Four Horsemen of the Apocalypse, he tweeted that, “Revelations reveals a FIFTH rider, from whom’s teets flow the tangy yet sweet juice of failed dreams and sponsorships.” There is more, but I’ll leave that alone. He posted a snarky review of a book he likely hasn’t read, tweeted it out to his followers on Twitter, encouraging them to review it and even offering a prize for the person who could write the “most helpful” review of the book. And his efforts were successful, leading to many reviews of the book. You can read them here, here, here, here, here, here, here, here, here, here, here, here and here. If you read the reviews, you’ll notice a pattern. Moms should not blog. Those who do are exploiting their children, they are having children to profit from them, they sell themselves out and are neglecting their families. Vaguely, the implication is that a woman should know her place. Beyond this offensive narrative, the reviews also state incorrect facts and ask obviously absurd questions. For example, this review mentions a chapter that doesn’t exist, this review references advice that is not in the book (and is vulgar), this review references a book by Sarah Palin that does not exist and implies that Palin herself is the author of “Mom Blogging for Dummies,” this review says that a book titled “Mom Blogging for Dummies” does not offer advice for dads and this reviewer even admits they haven’t read the book at all. At this stage, anyone with even a little bit of community management experience knows what is going on here. The question is: should Amazon want it? I wouldn’t write a post like this without going through the proper channels first. Beyond that, as I said above, Amazon’s customer service has never let me down before, so my presumption was that Amazon would handle these reviews once reported. Things slip through the cracks and, being a veteran in the community space, I know that question content gets past even the most well staffed community teams. In general, my perspective with the reviews system was that Amazon did a pretty good job with what is a difficult thing to manage. I wouldn’t judge Amazon based on the fact that this content had been published, but by what they did with the content once reported. I reported the reviews as abuse via the link next to each review, marked them as unhelpful and sent an email through the appropriate contact form on Amazon.com. In the message, I linked to the surrounding tweets and circumstances, explaining them, and linked to all reviews and quoted portions which were inappropriate and, I believed, in violation of Amazon.com’s review guidelines. It was a very polite, matter of fact message. With my communities, I appreciate when people point things out to me in a kind, helpful way. So, I am sure to do the same when I report things to other people. I received a reply pretty quickly and was told that a member of the Community Team would review each of the reviews that I mentioned and that any reviews that did not follow their guidelines would be removed. I was told that any changes that were made would appear shortly. I was really impressed by this quick action. I immediately went to the review page and found that some reviews had been deleted. I believe that number was 5. In my view, plainly inappropriate reviews remained, but I wanted to give Amazon’s Community Team time to look over them. So, I waited a bit over 24 hours and checked the page again. One more review appeared to have been deleted but, unfortunately, several others remained. Since I had been encouraged to reply if my problem had not been solved, I did so. This time, I thanked the Amazon employee for responding and expressed further appreciation that some of the reviews had been deleted. I mentioned that some of the damaging ones still remained. So, this time, I not only linked to the reviews, but I also included an explanation of what appeared to be inappropriate about them. I received a reply shortly after and the same person from Amazon told me that they had read all of the reviews of the book but the ones that were on the page at that moment were in line with their guidelines and would not be removed. I was surprised by this. Once again, I was encouraged to respond if this did not solve my problem. So, I did. This time, I sent a short reply expressing that it was difficult to see how the reviews I mentioned were in line with the guidelines, which list “obscene and distasteful content,” “profanity and spiteful remarks” and “promotion of illegal or immoral conduct” as things that are not allowed. I specifically referenced the video review. The emphasis is mine. This email did not include an option to reply if my problem was not solved. It was clear that this would be the final word on the matter. As a last ditch effort, just because I found this to be so absurd, I reached out to a semi-acquaintance at Amazon.com and asked him if he’d be willing to look into it for me. He did so and reported back much of the same thing to me. But, worse than that, a majority of the reviews that had previously been removed had now been added back! I can only guess that the person who reviewed them felt that they were now appropriate, even though they had been removed already, and made the decision to publish them once again. These type of reviews, which attack women and, especially, mothers who dare to blog are something that Amazon has chosen to “cherish”? How can this be? I felt disappointed because I generally trust the Amazon.com Customer Reviews and use them to make buying decisions. I even recommend that others, including my own family, do so as well. I can recall specific conversations where I’ve told my mom to look at the aggregate rating and read some of the reviews before buying a product. This isn’t about Wendy’s book. That’s just one example. It’s about the integrity of the system. If the review system as a whole lacks integrity, it cannot be trusted as much as I have chosen to trust it. Here’s the big problem, which Amazon.com will have to face eventually: you cannot have it both ways. You cannot “cherish” nasty, mean spirited parody reviews that seek to ostracize, and do not review the product at all, while also billing Customer Reviews as a section of the site people cannot trust. You cannot give them equal space. You cannot have it both ways. You may be familiar with stories where people latch onto a specific product on Amazon, for whatever reason, and post satirical reviews and that leads to increased sales for that product. 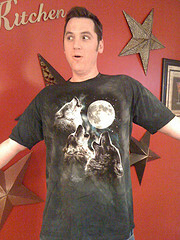 Perhaps the most mainstream example is “The Mountain Three Wolf Moon” shirt. I get that in some cases, these reviews can be beneficial. But, I have never seen it happen with a serious, business related product or a book like Wendy’s. Furthermore, I would suggest that there is a reasonable difference between good natured joking and that which is mean spirited. The reviews posted on Wendy’s page aren’t a stab at good natured humor, but at attacking and speaking down to people. Amazon needs to keep a few groups in mind when it comes to this particular issue. There are four main groups that Amazon must balance: customers, reviewers, authors/those who release products and the company itself. I want to make this super clear: the company should aggressively defend negative reviews. What I am talking about today is not about negative reviews. If someone read the book and wants to criticize it, and give it 1 star, that’s fine. If they used the product and have their reasons for reviewing it poorly, fine. Negative reviews must be protected and allowed. I am sure that Amazon receives messages from authors wanting critical reviews to be removed. They shouldn’t be. No argument there. The reason that is important is so that, when someone reads a review posted on Amazon.com, they can trust it. And that is what the reviews on Wendy’s book undermine. It’s not that they are negative. It is that they are not reviews of the product at all. They represent an effort to damage the standing of the product on Amazon.com, simply because a group of people do not like the idea of the book existing or of women, who are also mothers, blogging. While Amazon should not be in cahoots with authors, I feel like the company does a disservice to them by not taking action in cases like Wendy’s, when a person, or group of people, is acting like a bully. Should authors have to live in fear of people like this? Amazon.com’s Customer Reviews are important and they impact buying decisions, which impacts revenue, which impacts livelihoods. I think Amazon can do better. And I know it’s not easy. I know people may say you are censoring them, I know that people get mad when you remove their content. I’ve been doing it for 11 years. But, that is how you establish focus and encourage a productive online community: you write guidelines that speak to your goals and you fairly and evenly enforce them. Amazon is already doing this. When it comes to the review page for Wendy’s book, I believe that Amazon.com has failed to protect the integrity of their system and, from my messages with the people tasked with doing so, it appears that it’s not an error, but a concerted effort to play both sides of this issue. I feel that, eventually, this will need to change. Should Amazon.com play home to parody and jokes? Should Amazon want reviews where the reviewer hasn’t read or used the product? What about reviews where content from the book is plainly misrepresented – for example, where they mention a chapter that doesn’t exist? I think those are questions that need to be asked and answered and then adjustments can be made from there. If Amazon wants Customer Reviews to be taken seriously, then I think it makes sense for them to remove any reviews where the person says they haven’t read the book or used the product. I also think it is fair for them to remove reviews where the reviewer is clearly making things up about the book’s content. A book with 18 chapters does not have a 35th chapter. If Amazon feels that they must allow parody reviews, I feel like the best course of action would be to separate them in some way. They shouldn’t be given the same placement as serious reviews and they should not count in the calculation of the star-based aggregate rating that products are given. If Amazon wants to host them, fine, but give them a different area or tag them in a certain way and don’t let them affect the product’s overall star rating. Amazon must take steps to protect the integrity of their review content. If they must have both serious and parody reviews, there must be a way to ensure the integrity of both. This is an identity crisis. You can be a place that consumers can trust for honest reviews when making buying decisions or you can be a place for parody. You cannot do both. Not like this. If you try, you fail to do justice to either or to authors, serious reviewers and consumers. While particularly mean-spirited in this case, I don’t have as big of issue with the parody issue in general. Without the context of the post, reading through the some of the reviews made it clear that some wanted to clown on it. Amazon verified buyers are almost always better sources of information in that case and my preference would always be to display a review from someone who actually read it first. I guess what is more concerning to me is that this sort of astroturfing happens much more frequently (to both the detriment and advantage of the author) than anyone likes to admit. I know an author who rallied his online community to give five star ratings, vote down negative reviews and basically try to game the Amazon review system for his advantage. While they may send a note to the author, the reviews stay up because they aren’t indecent. That makes me much less trusting of the reviews there, especially for properties like books. And while parodies and humor might be easier to filter out, I wonder how they deal with these sort of “campaigns” in the future? Thanks for the comment. I think you raise some good points. In my view, the situation you describe is just as problematic as this one. You can never get everything. But, through the use of technology, a reporting system and smart, experienced human decision makers, you can stamp out a lot of it and defend the system. What I’ve noticed is that a lot of reviews are pure SPAM. You find the same person leaving the exact same review on multiple sites or one person reviews a line of products and nothing else. It seems anything goes. I’ve gotten to the point that if a review is positive, I will copy and paste the contents into Google just to see if it exists somewhere else or is legit. Thanks for sharing this experience. We are a small business with a product for sale on Amazon, and it’s scary how much power people have to hugely affect a product’s success or failure. Thanks for the comment, Rob. My pleasure. It can be scary, but look at it that way: people have always had a huge affect on whether or not a product was successful. If you make a good product that people want and offer great, attentive customer service, most likely you’ll do well. Nice article, the stuff about people hating on other’s books in the review was kind of disturbing. However, I think you’re missing one other crucial issue with the Amazon review system. Namely people astroturfing. Promoting their own products by pretending to be random buyers. There are pages for terrible, terrible books with suspicious reviews by people supposedly in the same area as the author and who’ve only reviewed that one book. There are even worse cases like those of Robert Stanek’s books where about 90% of the reviews are fake because said individual supposedly posts hundreds of fake reviews for his own books at every possible opportunity. Not to mention the cases of people giving their own work five stars and then going off to give one star ratings to every book they see as ‘competition’. Still, they say trolling and insults is something they ‘cherish’? Wow that’s disturbing. Thanks for the comment, CM30. Lance Haun, above, mentioned this as well. As I said, that sort of situation is just as problematic. It wasn’t really my focus in this post, but I’ve discussed astroturfing in various forms before. No problem. Just saw the post about that poker tournament thing and how they spammed your forums and what not. Wow, to say that’s unethical promotion is probably the understatement of the year, and it ranks up there with the likes of Sony’s fake blogs and movie critic or PublishAmerica’s schemes to scam people out their money. But hey, that was back in 2009. Could be interesting to see what the outcome was and whether anyone else called them out on it. Yeah, it was a crazy story. I had anonymous people emailing me, claiming to me employees of the company and making all sorts of claims. Most of which I couldn’t really publish because I couldn’t properly vet them. I actually got on the phone with the CEO of the company and, while he didn’t deny what I wrote, he wasn’t too happy with what I had reported. One or two other people did call them out on it (search for “Sports Legends Challenge” on Google and you can find some stuff) and the event was eventually canceled. I don’t think so high of myself to think that my writing made them cancel the event – they first said it was postponed due to weather, but it was never rescheduled. But, I’m sure that the negative attention didn’t help them. Amazon did finally remove all of Robert Stanek reviews last month – even the real 1 star ones, including the one I wrote last year for his awful Keeper Martin Tales book. There must have been hundreds of reviews for his many books, some dating back to 2002. Nice to see Amazon finally taking care of a problem that has been around for years. Stanek was the king of sock puppet reviews, but now it appears no one can post any reviews of his self published books (which is the next best thing other than just bannign all his books from Amazon).